I’m a bit of a HC fangirl truth be told. As you might have spotted from my Hotel Chocolat factory tour, I am really impressed with what Hotel Chocolat are trying to do. Last year they had a solid chocolate heart box filled with chocolates and I didn’t get one. I’m not bitter… much. I mean, I did try and buy myself one but they had sold out. I did get a lovely Easter Egg though! 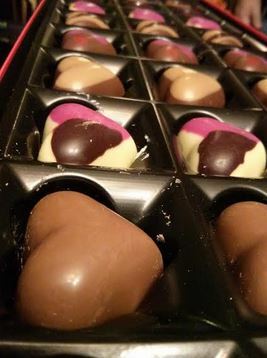 ANYHOO – so for Valentine’s day Hotel Chocolat has created many things but one of them is this sleekster of NINE DIFFERENT flavours of chocolate. 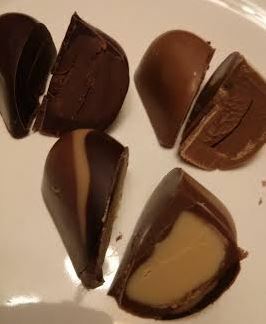 Sadly only two are boozy (gin and champagne) but they are delicious – especially the balsamic caramel. So what are the flavours? 72% Madagascan Cocoa Truffle – Rare cocoa truffle with natural notes of raspberries and cherries and a whisper of coffee says HC. Well, it tasted like Madagascan but it doesn’t have the lovely fruity acidity I’m used to HOWEVER there is very little bitterness and so it makes it a delightful dark chocolate truffle. Salted Almond Praline – Mellow almond praline in creamy white chocolate with a perfect pinch of salt. Also not a favourite. I think I might refresh my palate with something boozy 😉 Oh wait – there’s something fruity coming up! 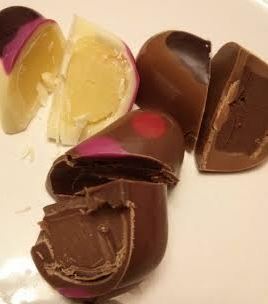 Passion Fruit Truffle – Tangy passion fruit purée blended into a creamy white chocolate truffle. LOVE IT So tangy and yummy and not too sweet I love the way it makes my cheeks tingle and the fruitiness is fab. Heart Champagne Truffle – Elegant and uplifting milk chocolate cream truffle with a generous splash of champagne. Actually kinda nice. 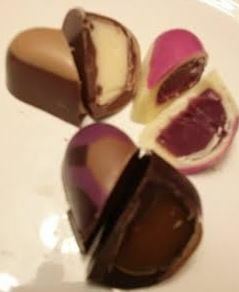 Gin Truffle Heart – Light London dry gin truffle with plenty of juniper notes and fresh citrus zing. I get mainly citrus and a zing of booziness 😀 I could eat a lot of these – ooooo dangerous! Balsamic Caramel – Deviously delicious soft caramel sharpened with a dash of cocoa balsamic vinegar. My favourite from the whole box. I’m going to have ti find these in the selector because I want a box of 6 all for ME!Slightly tangy but sweet and delicious. Not at all vinegar-y and I think you’re going to love it too. So with nine different chocolates to choose from there is something for everyone. I suggest you buy one quickly though because with 27 chocolates for £22 they won’t last long! Another great review of another great HC offering – it continues to amaze and impress me that such a large high street chain manages to not only sustain their high quality, but to continually raise their own bar with verve and imagination. I still ove them after all these years (and I can remember when they were Chocogram! ).